When residents in Santa Fe, New Mexico pay their water bills, they are now also paying for forest restoration. 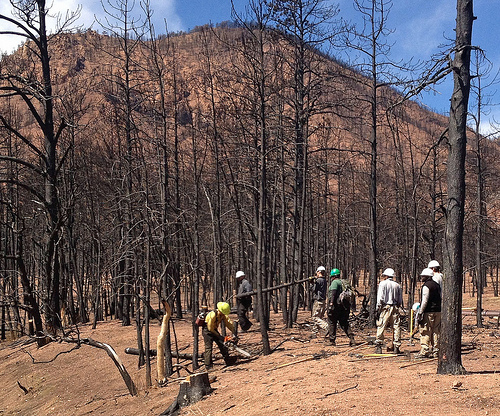 An AmeriCorps crew performs bank stabilization work at the site of the 2012 Waldo Canyon Fire in Colorado Springs, Colorado. Projects like this will be enhanced with the partnership between the U.S. Forest Service and Colorado Springs Utilities, which will contribute $6 million over the next five to 10 years. Several utilities in the western U.S. are entering into such partnerships to reduce fire risk in their watersheds. Click to see an enlarged image. They are signs of the times – forests in the western United States are dust-dry and budgets in Washington, D.C. are diet-thin. While the West is in the thrall of drought, ecosystem upheaval, and near-daily conflagrations, the nation’s capital is held by fiscal austerity and government-wide spending cuts — which makes partnerships like the one between several cities in the western U.S. and the U.S. Forest Service beneficial to both sides. A severe fire in a city’s watershed can turn a clear mountain stream into a cauldron of black goo. The flush of ash and sediment clogs water treatment pipes and eventually winds ups in reservoirs, filling them and forcing expensive dredging. To avoid this, some cities are being proactive, first with grant funding and now with their own money. After being underwritten for more than a decade by state and federal dollars, last month residents in Santa Fe, New Mexico began footing the bill for work to reduce the risk of wildfire in the city’s upper watershed, much of which lies in the Santa Fe National Forest. Through its water rates, the city will spend $US 5.1 million over the next 20 years on a broad program of forest management and public education. Much of the money will go to the U.S. Forest Service to cut and burn redundant trees, restore streams, and test water quality. That amounts to roughly $US 0.83 per month for each household. The Nature Conservancy is also a partner in the project. Expenditures made now could save money in the long run. A major fire could shut down the two reservoirs on the Santa Fe River, and dredging the debris would cost between $US 80 million and $US 240 million, according to city estimates. That is in addition to the tens of millions of dollars to fight the fire and the added cost of shifting the water supply to groundwater, which is more expensive to pump and treat. Santa Fe’s water department is one of several urban utilities – including those in Colorado Springs, Denver, and Flagstaff, Arizona – that are putting ratepayer dollars to work in the forests. The U.S. Forest Service, for its part, helps the utilities with the technical aspects of forest restoration and some of the physical work while using most of the money in its budget to focus on other high-risk forests in the state. “The benefit is that it allows us to do more work in other places,” Sandy Hurlockler, district ranger in the Santa Fe National Forest, told Circle of Blue. A history of forest mismanagement has combined with drought and massive beetle-kills to turn the American West into a pile of kindling. Recent forest fires, including the High Park fire outside of Fort Collins, Colorado last year, have water utilities on edge. Yet the most destructive blaze for drinking water infrastructure happened more than a decade ago near Denver. The 2002 Hayman fire, still the largest in Colorado’s history, burned 55,800 hectares (138,000 acres) southwest of the city. Subsequent rainstorms swamped Strontia Springs reservoir with enough sediment – 765,000 cubic meters – to fill Denver’s basketball arena five times. Combined with the damage from a 1996 fire in the same area, Denver Water, the public utility, spent $US 26 million dredging and restoring two of its reservoirs. In 2010, Denver Water entered into a five-year partnership with the U.S. Forest Service with the goal of reducing the risk of catastrophic fire. The two agencies will each spend $US 16.5 million on forest restoration, with Denver’s share coming from ratepayers. This type of investment is called a payment for ecosystem services, a financial model that protects the natural processes that benefit people. Forests filter water, and their soil helps to slow down the surge of runoff after a storm, calming potential floods. Fires eliminate these benefits for some time. Erosion, poor water quality and higher flood risks persist long after the flames have been snuffed out. Earth Economics, a research group, and the U.S. Endowment for Forestry and Communities, a nonprofit advocate for forests, charted at least 17 instances in the U.S. in which money from city or utility budgets is being put toward watershed management, most in areas other than wildfire risk. Spending money on fire prevention is tricky, said Rowan Schmidt, an analyst at Earth Economics, because there is no rule of thumb for how much investment in a watershed will pay off. But that has not stopped cities from signing onto programs. Last November voters in Flagstaff, Arizona approved a $US 10 million bond to cut fire risk on 5,460 hectares (13,500 acres) in the Rio de Flag and Upper Lake Mary watersheds. And this spring Colorado Springs Utilities signed a five to 10-year agreement with the U.S. Forest Service, providing $US 6 million from ratepayer funds to restore parts of its watershed scarred by the Waldo Canyon fire last summer. The money will also be used to reduce future fire risks in other areas where the city draws water. “Our ongoing relationship with the Forest Service will help us channel customer rate dollars in the most efficient way possible to protect our most vital resource and the forest that surrounds it,” said Gary Bostrom, chief water services officer for Colorado Springs Utilities, at an April 4 press conference. As far as fire goes, Santa Fe’s watershed is a bull’s-eye that has not been hit. A map of fires in northern New Mexico since 1970 shows burn scars looped around the capital but no direct hits. In fact, Hurlockler said, tree-ring studies indicate that the watershed has not had a major fire in several centuries. Roughly one third of the Santa Fe watershed has been thinned and selectively burned since 2003. Forest managers have not attempted any treatments in the wilderness portion of the upper watershed, but the city is preparing to release an environmental assessment that will propose prescribed burns for 1,175 hectares (2,900 acres) in that area, according to Dale Lyons. Until recently taking a job with the Nature Conservancy, Lyons worked for the Santa Fe water department and he helped write the city’s watershed management plan, updated this spring. Tree thinning and prescribed burns can reduce the risk of wildfire but they will not eliminate it. When Lyons saw the smoke over Santa Fe in early June from the Tres Lagunas fire burning a few ridges east of the city’s watershed, he hoped that the wind would not change directions and blow embers to the west. With the fire now almost contained, that particular threat has been stamped out, though others undoubtedly remain.